I was supposed to package my specialty beer on Thursday this week, but the universe had other plans. Rick Mercer was coming a-calling at the college today to shoot segments for his TV show in both the brewery and the college winery, so a couple of us students with beers ready to package were asked to come in and bottle our beers a few days early. 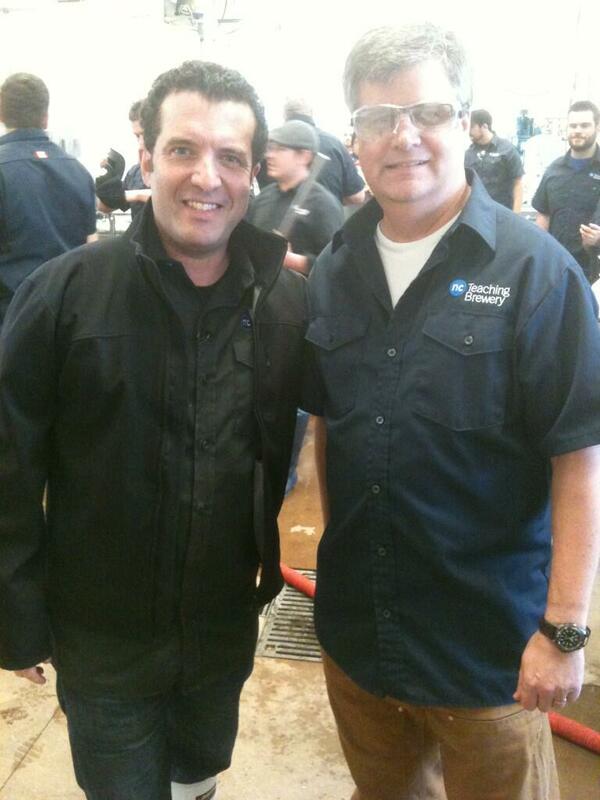 Rick Mercer, showing no ill effects from drinking my black IPA straight from the bottle. Imagine the scene. There we were, innocently bottling beer whilst whistling cheery melodies, when suddenly we were having a conversation with Rick Mercer. A handshake, a few more seconds for a quick photo with Rick, then he moved on and we finished bottling our beer. If the TV gods are with us, our conversation with Rick won’t end up on the editing room floor, and next Tuesday (March 19), we will be pasted across your flat screen TV for a few seconds. Don’t blink. If it will get you to the store faster: It pours black and opaque, with the slightest hint of ruby at the edges. The fine-beaded ivory head is rocky and long-lasting. The nose speaks of fresh cut apples and pears, with just a slight hint of citrus and pine. The mouthfeel is medium-to full-bodied, the flavour sweet at the forefront with notes of chocolate and coffee; however, a firm bitterness quickly moves in and provides a dry finish with hints of roastiness. Will pair well with curries, spicy sausage, shepherd’s pie, roast beef. At a small brewery, there’s always lots to do, so generally you have your tasks to perform, and everyone else has their tasks to do. But not on bottling days. Bottling requires all hands on deck. For an hour, we prep the heart of the bottling line, a snorting, hissing beast called a Meheen. Then, with all in readiness, and everyone at their stations, we’re off! The person at one end uses a neat doohickey to pick up 24 empty bottles at a time and flip them upside down on the sanitizer station. Once sanitized and drained, the person picks them up again, flips them right side up and slides them into the loading chute of the Meheen. From there, the bottles advance six at a time into the mouth of the beast, and emerge from the other side filled, crowned, and washed. They then enter the labeller, where they elegantly spin around as a label is glued on. From the labeller, the bottles head to a turntable, where they go round and round until picked up by the glue monkey, who packs them into cartons and glues the cartons shut. Sounds easy, right? Let’s go back and take a closer look at each operation. With the Meheen devouring six bottles every ten seconds or so, the person feeding it bottles has only 30 seconds or so to retrieve 24 empty bottles from a nearby skid, assemble the bottles into a 4×6 grid, move the bottles on the sanitizer to the infeed, and move the new bottles to the sanitizer. But wait, there’s more! This person also has to keep an eye on the hopper holding bottle crowns and refill it from time to time, and watch the bottles as they get filled and crowned to make sure there are no problems. Then there’s the true instrument of the Devil, the labeller. Yes, if anything can go wrong, it’s probably the labeller’s fault. Too much glue. Too little glue. Labels that refuse to enter the labeller. Labels that enter the labeller three at a time. A sticky bearing that requires disassembly and reassembly. An empty label magazine. Ninety percent of shutdowns are the result of the labeller. And finally, the glue monkey. With six bottles heading his way every ten seconds, he barely has enough time to grab a couple of empty cartons, then pick up bottles four at a time (or even six at a time), stuff them into cartons, glue the cartons shut and move the cartons to a skid–but the glue monkey is also the last person to see the beer before it moves to the consumer, so has to watch for and sequester low-fills, unlabelled bottles, bottles with too many labels, and any other problems revealed by a visual inspection. It takes about an hour and a quarter of continuous work at top speed to fill a skid with 2,016 bottles. Once you’ve finished a complete skid of bottles, grab a bottle of water, disappear into the walk-in cooler for a few minutes to take a breather–then it’s time to fill another skid. Repeat until the brewmaster says whoa. Having an accurate idea of how many yeast cells you are pitching into your wort–and what percentage is alive–is pretty important. In Microbiology Lab today, we learned how to count yeast. If you had to count all the yeast cells in a yeast slurry, it would take you a while, since there are usually several million yeast cells in one droplet. To make the counting job easier, the usual procedure is to dilute the slurry, then look at a very small but defined volume of it under a microscope, then do some math. We didn’t have a yeast slurry handy, so we took a 1 mL sample of a lager fermenting in the Teaching Brewery, then added 9 mL of water, thus diluting it 1:10. By taking a 1 mL sample of that solution and adding 9 mL of water again, we ended up with a 1:100 dilution of the original beer. In order to tell which yeast cells were viable and which were not, we added a drop of methylene blue to the final dilution. This turns dead cells blue, but yeast cells that are alive and kicking don’t allow the dye to enter their cells walls and remain clear. A haemocytometer. The dark squares are the five used for counting. The small dots are yeast cells. Using a very small capillary pipette, we transferred a tiny amount to a special microscopic slide called a haemocytometer. This slide has a covered section of 25 tiny cross-hatched squares with a volume of 100 nanolitres (a millionth of a litre, or 1/10,000th of a mL). Looking through a microscope, we could clearly see live and dead yeast cells within the 25 squares. Although counting all the yeast cells in all 25 squares would be easier than counting all the yeast cells in a droplet of original beer, it would still be tedious work. To improve the lives of lab technicians everywhere, the scientific world has developed a protocol of only counting the cells inside one-fifth of the squares–the four corner squares and the middle square–then multiplying the results by 5 to arrive at a reasonably accurate average for all 25 squares. I multiplied the 19 viable cells x 5 to arrive at the total cells in the haemocytometer = 95. Since the volume of the haemocytometer was 1/10,000 of a mL, I multiplied 95 cells x 10,000 to get the number of cells in 1 mL of our solution = 950,000 cells. Since we had diluted the original beer by 100, I multiplied 950,000 cells x 100 to arrive at a yeast cell count of 95 million yeast cells per mL of fermenting beer. However, since we had counted 10 dead cells, our percentage of viable cells was only 66%. On to Packaging, where we had our fourth “Fun Quiz”. Then it was on to the bottling line. Apparently fillers are fairly temperamental machines, so once you have your filler going and it is in a happy place, it’s a good idea to keep it going if possible. So if your labeller suddenly starts firing labels in every direction, a well-designed packaging line can allow the filler to continue to placidly fill bottles, which then can be accumulated in a holding pattern while you quickly adjust the labeller and get it restarted. We also looked at dealing with broken bottles on the packaging line, and soaker/washer machines that automatically clean and sanitize bottles inside and out. Normally fascinating stuff, I’m sure, but the Easter long weekend was calling, and when Doug Pengelly ended a few minutes early, the classroom emptied with amazing speed. I love to start Friday mornings with a business math test at 8:30 a.m.
I’m lying. You probably already knew that. It’s not that I don’t like math tests. As tests go, math tests are fairly easy if you’ve done your homework. No combing through the memory banks, no “compare and contrast” essay-type questions, no multiple choice dilemmas. Just read the question and figure out the answer. But tests first thing in the morning get my adrenaline going. My heart rate climbs. I feel hyper-focussed. Then the test is over and… now what? The adrenaline is still going. I feel twitchy and hyper. I should go down to the fitness centre and burn off some serious calories. Instead, I sit in Gordo Slater’s Intro to Brewing class and listen to some more dream brewery presentations. Last week, all the presentations were set in Ontario. This week, the breweries are set further afield. The first is set in Hawaii. The second in Dorval, Quebec. And the third–my team’s effort–is in Cumberland, B.C., on Vancouver Island. They gave us a standing ovation. 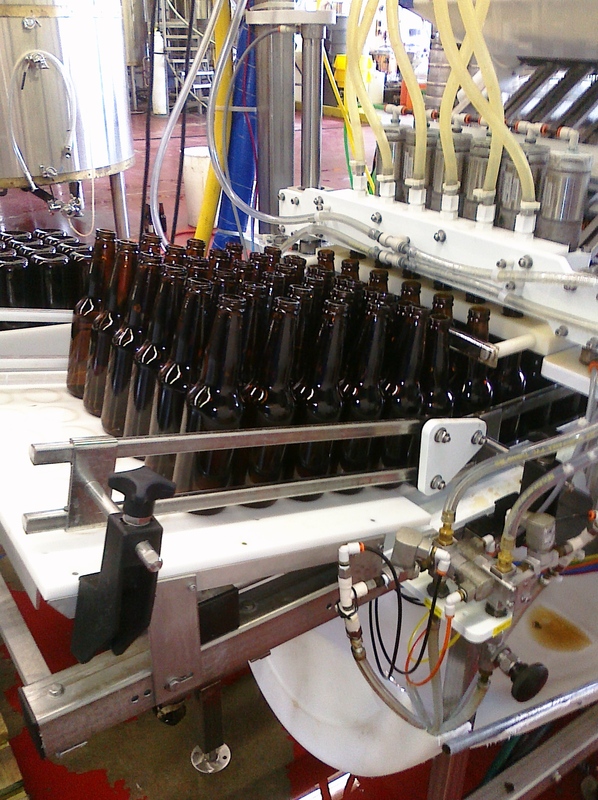 After our presentation, the class entered the world of packaging–that is, bottling the beer. As Gordo put it, the beer sitting in the bright tank waiting to be bottled is (hopefully) the epitome of your art. After it leaves the bright tank, all you can do is screw it up somehow. Let oxygen get into the bottle. Don’t fill the bottle enough. Use a chipped bottle. Are your crowns rusty? Is your label crooked or torn? 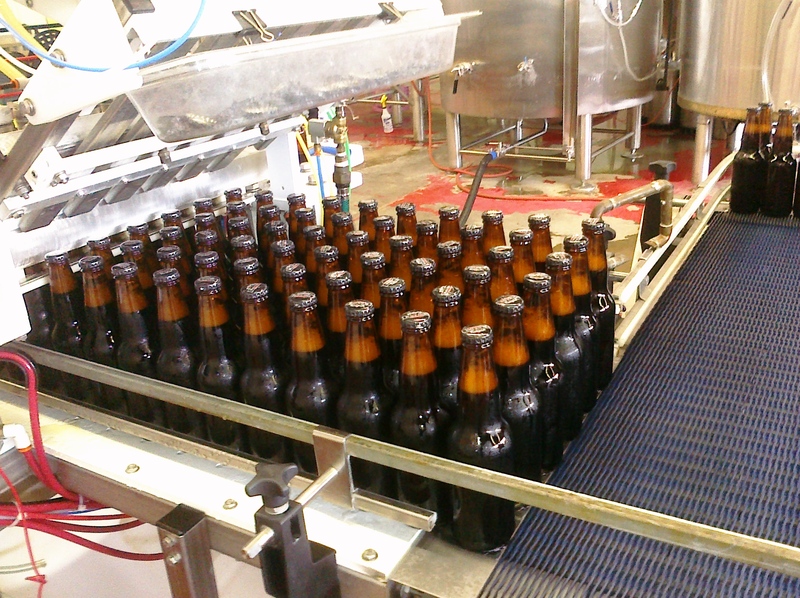 Your last line of defence against these problems is the guy sitting on the bottling line. So remember, if I get a job this summer as a lowly bottler, simply refer to me as a guardian facing down the forces of Chaos.